The Italian Serie A is slowly turning into a two horse race. After seventeen game weeks, both teams at the top of the ladder are not much further apart. The Italian champions, Juventus, were held to a 1 - 1 draw by Inter Milan in Turin. Prior to that match, Roma had won their fixture against Udinese by a margin of one goal. Davide Astori got the only goal of the game, which allowed them to close the gap. For the 'Old Lady', Carlos Tevez scored the goal after a great piece of skill and assist by Arturo Vidal. But the Argentine's goal was canceled out by Mauro Icardi in the 64th minute. Paul Pogba also came very close to scoring a goal after pulling off a brilliant elastico to get away from the defenders. On Sunday, January 11th, Juve will be travelling to Naples for the crunch tie against Rafael Benitez's side. Napoli are fourth in the league, with only a goal short of third position. It will be a very exciting week of football in Italy as the top four teams will play against each other. Stefano Pioli's Lazio will be facing their city rivals AS Roma. There is a possibility that all the top four teams change their position by the end of game week 18. 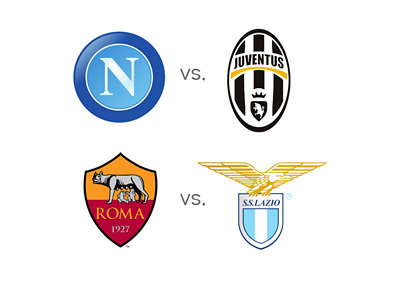 Although there is a nine point difference between Lazio and Roma, we can expect it to be a very tight match. Both teams have drawn equal number of games (three), but Roma has the edge in the number of victories (twelve compared to nine of Lazio). Also, Roma's home record has been flawless as they have won seven, drawn two and lost none. But yes, judging by their recent run of form, it is hard to predict who'll come out on top. In the last five games, both teams have won three and drawn two. Last time around, when Roma and Lazio faced each other in February 2014, the match ended in a goalless draw. Their last meeting was in September 2013 and in that fixture Roma came out on top as the match ended 2 - 0. Rudi Garcia's side has a good chance of reaching the top of the table as the season reaches its midway mark. AS Roma might not have it so easy though. This Lazio side are the most in-form team in Serie-A at the moment. Their Brazilian midfielder, Felipe Anderson, is on fire at the moment with 4 goals and 4 assists to his name in the last 4 games. Napoli win: 19/10; Draw: 23/10; Juventus win: 11/8.